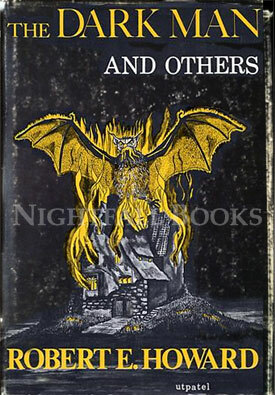 Arkham House, 1963; 284 pp. ; limited to 2000 copies. First Edition. The Dark Man and Others is a collection of fantasy and horror short stories by American author Robert E. Howard. It was the author's second collection to be published by Arkham House. Most of the stories had appeared previously in the magazine Weird Tales. Book is solid and clean; black binding cloth is clean and shiny; boards are unbumped and corners sharp, with minor wear along bottom edges and somw bumbping on top and bottom of spine; gilt lettering on spine is bright; pages are clean and bright; former owner's bookplate pasted inside front board. Dust jacket front is clean but shows wear, rubbing, and fading along the length of the flap fold and the spine as well as across the cover; small chips and wear are present at the top and bottom of the spine and at the flap fold corners; flaps are clean and bright with age yellowing along top edges; original price ($5.00) is unclipped; rear cover is yellowed and shows some smudging especially along top edge and spine, with a 1/2" tear at the top. Overall, this is a near fine copy of the book in a good dust jacket. "The Men on the Ground"